With lots of days of perfect weather, Chicago is a delight in the summer - this is our camping off season! The big city offers a plethora of interesting activities for all tastes - including the taste of Chicago food festival. We bike the lake front, go to the theater, golf and generally enjoy the summer ambiance surrounding the big city. 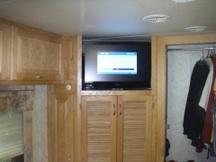 Rving is never far from our minds as we planned to replace the factory installed TVs in the rig. This is a challenge because we didn't want just big holes where the old ones once sat. 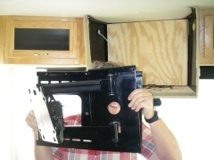 There had to be new LCD models that would fit into the hole without alot of specialized carpentry. After some planning and measuring we found models that would fit the holes but how would they be mounted? It actually turned out to be easier than we thought and only minimal cost beyond the cost of the TVs themselves. Based on our experience, most of our listeners should be able to make the transition. 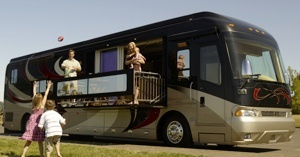 As always we talk about trends in the RVing world which is dominated by rising gas prices. It only cost us $250 to put in 52 gallons of diesel last week on our short trip to Elkhart, IN. Will be get used to spending 55 cents a mile? Ask us next year. This is the first anniversary of our purchase of the motorhome and we ask ourselves would we do it again? As always we appreciate your comments and suggestions both via email and listener comment line. 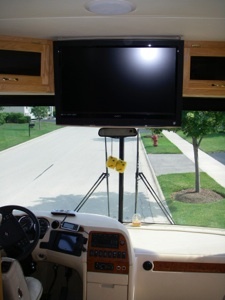 Send comments, suggestions and ideas to navigator@rvnavigator.com or use the comment hot line 815/230-0772. 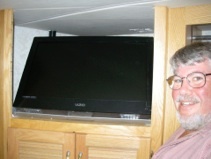 Your RV Navigators (& Friends) replace their RV TVs. 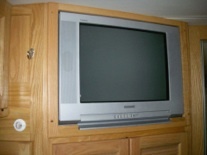 Empty cabinet with coax - screen in back provides ventilation for old TV. 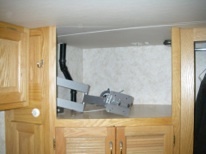 The cabinet did not have many strong points to attach a new articulated arm mount for the new LCD TV. We mounted a piece of ply wood about 8 inches back in the cabinet on which to mount the new TV. Above - arm mount as it comes out of the box. 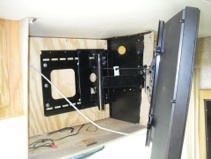 Left - plate is mounted on TV using mounting holes provided by manufacture. LCD TV and mount assembly ready for cabinet install. Base plate is mounted to plywood and TV is installed on the arm. Base plate is off center so that the TV will be centered in the cabinet. 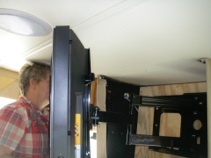 Elastic cords inside the cabinet hold TV tight to the outer frame for travel and general use. The new 32” LCD covers the hole left by removal of the old 26” TV. We removed the wooden frame and then the old TV slipped out of the cabinet. I planned to use another articulated arm mount (upper right), but I found that the new 26” LCD would fit the cabinet opening from behind. The new TV was slipped into the cabinet and held tight to the front with make shift anchors made up of a screw, spacer and fender washer. Once the screws were tightened, the TV was held very securely against the back of the front of the cabinet (lower right). Rope cam used to secure the TV against the old cabinet. Rope is attached to the back of the TV and pulled tight via the cam to hold it while traveling. 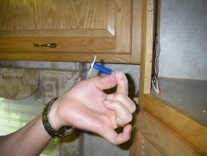 Cam is attached on the inside of the left cabinet with the rope coming through a whole between the cabinets. to hold the TV tight against the cabinet while traveling. I am considering other methods to secure the TV but this one is invisible when the TV is in place.